The Boompod Headpods are some of the best sounding headphones we have tried! When we tested these, the sound was absolutely amazing! Lose yourself in your music with our adjustable headband and cushioned ear cup. Features a fold-flat design for easy storage and transport when not in use. 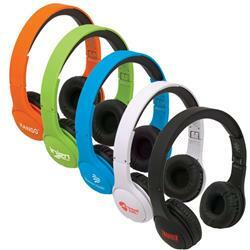 Includes a 3.5mm audio jack and sound similar to Beats headphones - all with your custom logo and 5 attractive colors. Production Times Available: 5 days with proof. • Adjustable headband and cushioned ear cup. • Features a fold-flat design for easy storage and transport when not in use. Includes a 3.5mm audio jack. • Your choice of one of 5 different color headphones.